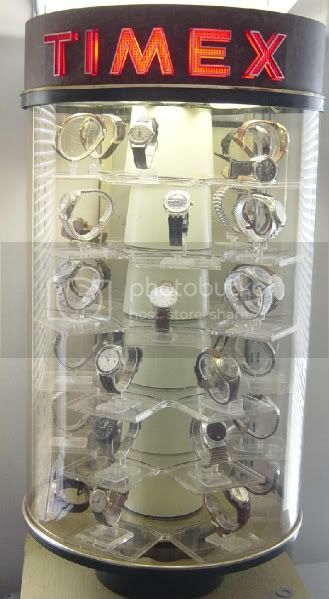 A 1970 Timex display cabinet. This year is pretty well centered in the era of watches I like best. Most watches were still fully mechanical. Go back 10 years, and watches were tiny by todays' standards. Forward 10 years, and they are mostly quartz--Superior timekeepers, but it isn't nearly as interesting when even a basic department store watch is equal (or superior) in performance to an expensive luxury brand. You bought the whole case full of watches? Uhh, what time is it? I don't own one single watch. How weird is that? No, I already had the watches, plus some. Those are the ones that run, about 40 of them. I've got another 10-15 waiting to be fixed, plus an unknown number of parts watches. None are particularly valuable. In part because of my budget, but largely because I'm interested in the mechanics rather than the jewelery aspects. It isn't that weird to not wear a watc--You probably carry a cellphone with the time, and it is pretty rare to be someplace without a clock of some sort. I agree that the 70s are the best period. Not only were there plenty of nice mechanicals about but also Accutrons and electric balance-wheel watches (as on http://electric-watches.co.uk). All good stuff. I've been to http://electric-watches.co.uk a couple times, interesting site. The balance-wheel electrics puzzle me a bit as to why they were as popular--The only advantage I can see is if you only wore them occasionally, they would continue to keep time. Other than that, a tried-and-true automatic was as good. Keeping time when not worn would be useful. I have seen it written that automatics are slightly more accurate than hand-wound due to the mainspring being kept under constant tension when worn, and I suppose that the constant electrical impulse is slightly better than that. Not as accurate as a tuning fork or quartz, though. Unfortunately for me I have developed the sudden urge to buy some of these. I just picked up a Timex Dynabeat to try repairing. In relation to your point about keeping time when stored, it is designed so that the power is turned off when the crown is pulled out. I've got a handful of Timex Electrics--A Dynabeat, an "Electronic" and a couple of balance-wheel quartz. The quartz have the same movement as the electrics, with the addition of a small circuit board that can adjust the rate of the balance wheel. You may be interested in the Timex forum at http://www.network54.com/Forum/446505/. Not limited to Timex, any reasonably-affordable watch is welcome. The balance wheel quartz watches are very interesting. Thanks for the link - I'll take a look. I found it in a nearby village junk store. If I remember right, it was $35. I would have paid more.